Black community organizers in Chicago are blasting the ‘racist Democrat machine’ and rampant corruption as the primary reasons their once-great city is deteriorating rapidly amidst shocking violence, crippling economic depression, and eroding infrastructure in a powerful new short film. 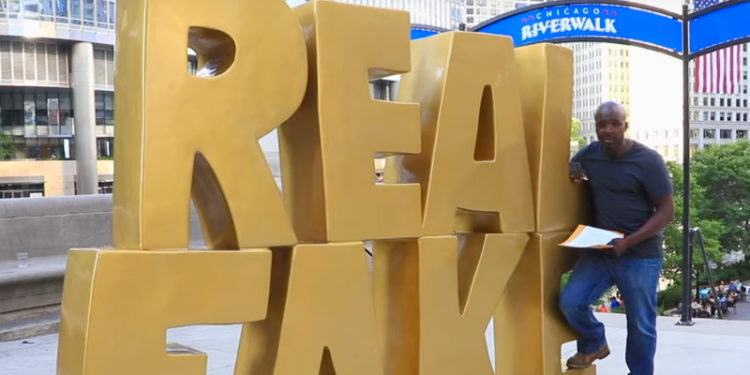 Rebel Pundit has released a new production entitled “Chicago Carnage: Black Activists Slam #REALFAKE Trump Tower Deception” centered around a new anti-Trump sculpture erected by the city – on the taxpayer dime – directly across from the iconic Trump Tower. In their scathing commentary, local activists Paul McKinley and Mark Carter lay blame squarely at the feet of nefarious city and state political leadership – which is overwhelmingly Democrat – and even Barack Obama and Bill Clinton, also expressing hope that President Trump has the opportunity to make Chicago great again and inviting his administration to help drain the Illinois swamp. Both men denounce the notion that Donald Trump could possibly be to blame for decades-old local issues when he has only been president for six months, and accuse progressives of simply using him and the specter of ‘white racist conservatives’ as scapegoats to deflect attention from their own self-serving and/or criminal behavior. The men conclude by asking President Trump to send in federal investigators to break up the corrupt Chicago juggernaut – something he has already threatened to do. “If he does that, he can make Chicago great again,” says McKinley in closing. This is not the first appearance McKinley and Carter have made in films denouncing Democratic politicians and attempting to pry black Americans away from their overwhelming loyalty to socialist demagogues. In “Voices of the Ex-Offender – Chicago Activists Message to Black America” – another presentation by Rebel Pundit from 2014, they delivered a similar wake-up call, which Infowars covered at the time.